Hi guys, I’m Michaela. I recently started my own blog, Michaela-Leigh, a few months ago and so I am quite new on the blogger scene. I am so happy that Becky picked me to do a guest post on her brilliant blog, as I have been following her for a while now. Today, I have decided to do a post about my top 5 beauty buys for under a £5. I am a firm believer that some high-street brands are just as good as some higher end products, and drug-stores offer such great value for money. Furthermore, I thought that would share with you some of my favourite products that I am currently loving. Firstly, I have always been a hoarder when it comes to Barry M nail varnishes – I have pretty much every colour under the sun! I was so excited when the Hi-Shine polishes came on the market and since using Blogger, I have read multiple rave reviews on this product. I recently bought the colour ‘Blackberry,’ which is a beautiful deep navy shade to go with a dress I recently purchased. Upon my first use of the varnish, I was hooked immediately. The formula is so thick, hence for a dark colour like this one, you only need to apply one coat (which is great if you are in a rush or are impatient with letting your nails dry properly.) The finish is ultra glossy and looks like you have just had a professional manicure. The only downfall to this product is that it tends to stain my nails a little, so I recommend that you always use a top coat before application. I love this colour so much that I definitely want to buy some brighter colours for summer, I have my eye on the shades ‘Guava’ and ‘Mango’ next. I have always been somebody who likes to experiment with my skin care. Consequently, I have tried pretty much every face wash and face scrub on the market. 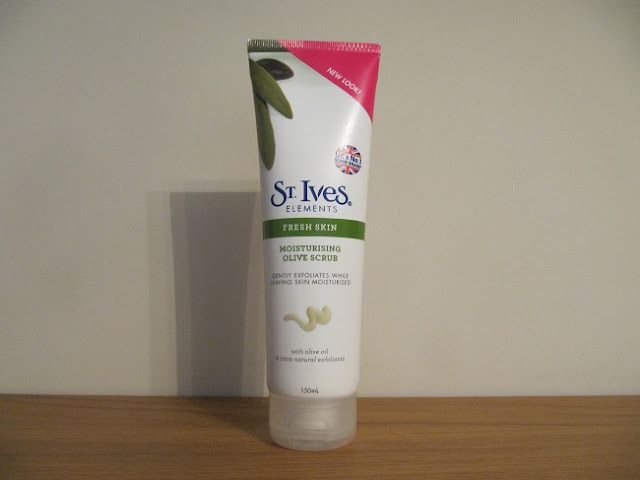 However, since using this St Ives olive scrub, I never want to go back to any other scrub ever again! The scrub claims to ‘re-energise the skin without greasiness,’ which is perfect for combination skin which can tend to get rather oily. In addition, the exfoliating beads are not too rough or coarse, which means that the product can smooth my face without irritating my skin in anyway. The thing I love most about this scrub is its brilliant moisturising properties. Using this product alongside my Simple moisturiser every morning leaves me with smooth, hydrated skin which provides an excellent base to apply my make-up on to. I definitely recommend this scrub to those with combination skin who love skincare products with a lovely, fresh scent. I first bought this powder shortly after discovering Tanya Burr’s YouTube videos a few months back. 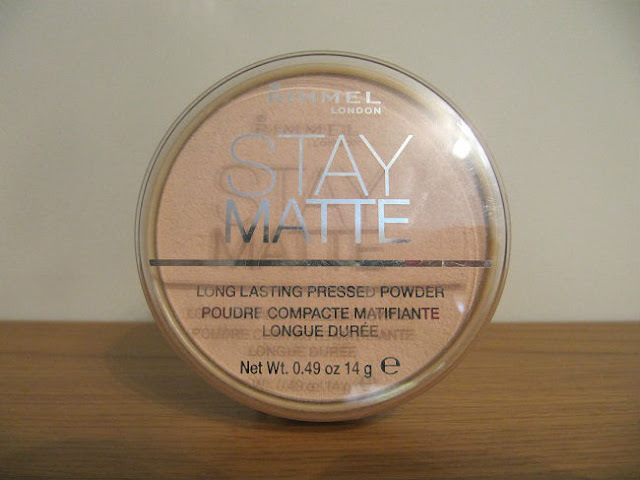 I was surprised that an established make-up artist such as Tanya swears by such a low-end brand of powder rather than an über expensive one, and as a lover of Rimmel anyway, I knew that I had to have it! As mentioned above, I have combination skin and I can never apply make-up without using a powder afterwards to set it in place. That being said, for years I had been using 17’s Pressed Powder, which looking back on it now was not a very good-quality powder at all. However, since switching over to the Stay Matte powder, I am so impressed! This powder banished all of the shine on my face, especially around my T-zone which tends to be my most troublesome area. Also, a light dusting of this product on to my powder brush goes a long way, so I know that I will not be hitting the pan of this product any time soon. For £3.99, I believe that this powder should be a staple in every girl’s make-up bag. 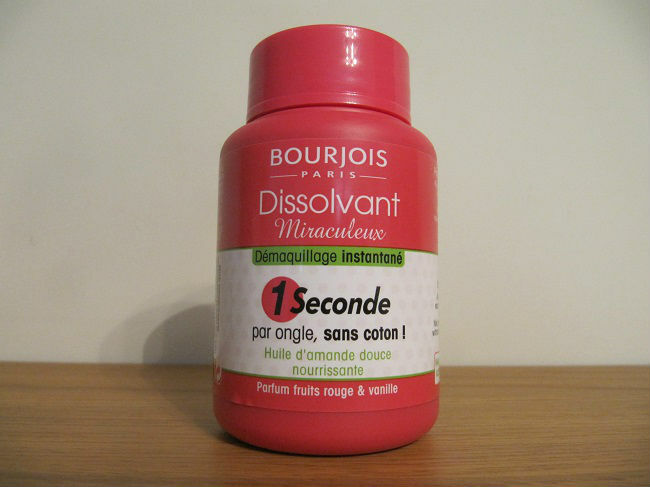 I recently purchased this product on a bit of a whim whilst browsing through the Bourjois stand in my local Boots store. To my delight, there was an offer where if I bought any two nail-related Bourjois products that equalled to £8 or more, I would receive a free Bourjois nail art kit which includes 150 stickers and stencils. Let’s just say, I couldn’t resist! As for the polish remover itself, it’s brilliant. I often find taking my nail varnish off such a chore and I always get through so many cotton wool pads, it feels so wasteful. To use this product, you simply dip each finger into the sponge inside the pot, wait a few seconds and twist your nail, then remove it. The process is so instant and can even remove two or three layers of varnish in a matter of seconds. Pretty impressive, right? The only downfall to this particular product is the smell is quite over-powering, despite the fact the product doesn’t even contain any acetone. On the bottle, it also claims to have a red fruit and vanilla fragrance, which is not the case at all. However, the simplicity of the product is definitely worth the slightly unpleasant smell in my opinion. Last but not least is this brilliant shimmer from Rimmel. I find that after I apply my foundation, powder and blusher, my face is very two-dimensional and matte. In turn, this can make my complexion look extremely dull – especially during the summer months. So, when I saw this product and swatched it whilst in Boots, I knew I had to have it! I chose the more bronzed coral colour as opposed to the pink shade they also do, as we are into the summer months now (despite the English rain) and I have a slight tan now. I apply the cream just about where I apply my blusher, just like a highlighter, to make my cheekbones have a nice glow to them. The product is a great consistency and a little goes a long way, but its one negative point is that there are a few too many glitter particles for my liking. Saying this, I do definitely recommend this shimmer for anybody whose skin needs a bit of a pick-me-up. 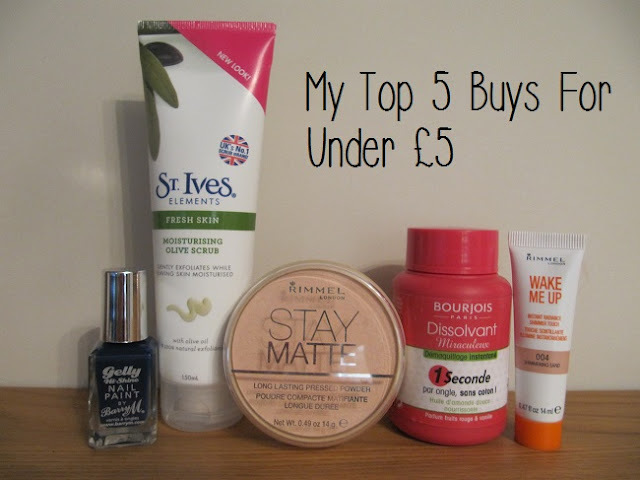 I hope that you have all enjoyed reading about my top five beauty products for five pounds or less. I would also like to thank Becky again for giving me the opportunity to feature as one of her guest bloggers. I would love to know which products under £5 you all recommend, so feel free to leave a comment below. Also, if any of you have already used one of the products above, I would love to hear you opinions of them too. In addition, if you liked my guest post, I would appreciate it if you would check out my blog too. Thank you! I love St Ives. In America they have loads more yummy scents in their range - no fair! I was never sure about the Bourjois nail polish remover in the pot but it's been raved about and better than leaving cotton pads lying around for the dog to thieve! 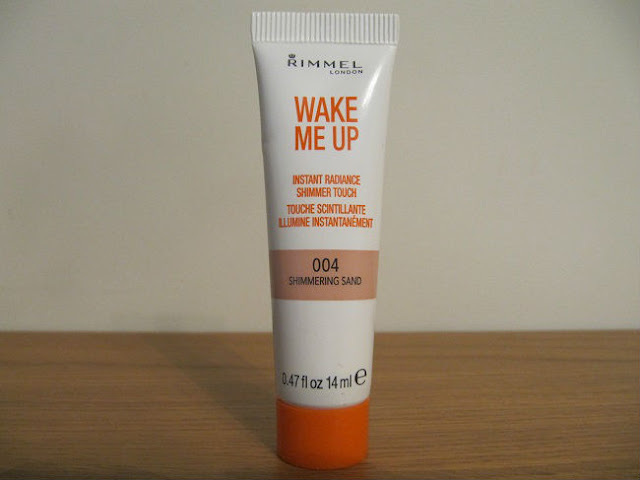 I love the Rimmel Wake me up foundation, I may have to try others in the line like that instant radiance shimmer! I love the Stay Matte powder! I've been using it for years, it sets my makeup like no other. I have the Rimmel Stay Matte Powder too! I absolutely love it!